Caption: The MK V tank in which Whittenbury won his MC. The Tank Museum in Dorset has launched an appeal to find the Military Cross (MC) won by the commander of its Mark V tank. Harold Whittenbury’s heroics at the Battle of Amiens, 100 years ago, which included ramming a building with his tank, earned him the bravery medal. But its whereabouts are unknown and the museum has found scant information about the man who commanded the tank that is on display. Whittenbury, from Manchester, was protecting Australian troops with the Mk V tank no. 9199, on August 8 1918 – the start of the battle that is considered the beginning of the end of the Great War. The museum is marking the occasion and wants to know more about Whittenbury and ideally find his MC to exhibit. 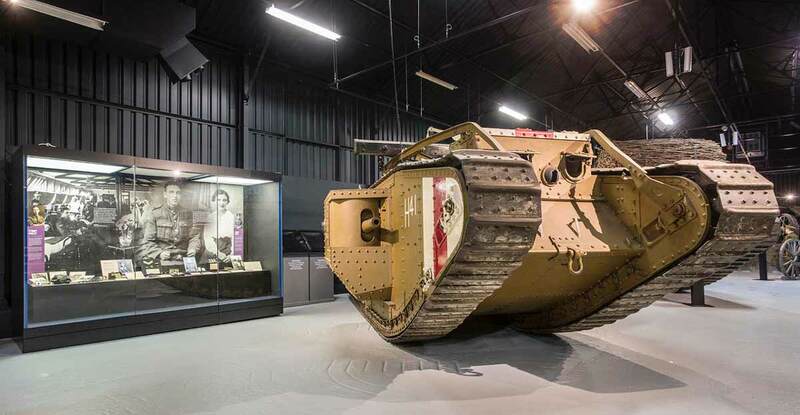 David Willey, curator of the museum in Bovington, said, “The tank itself returned to the UK after the war and was used here for training during the 1920s. “It was maintained and continued running and was used in parades, demonstrations, TV shows and was even put to use demolishing a cottage in 1938.To preserve the machine, it eventually stopped being run, but remains one of our most popular exhibits. “However, we’d love to know more about the man who commanded it so successfully at the Battle of Amiens and we’d love to find his Military Cross and possibly display it. Harold’s MC citation tells us: “…he displayed great coolness and resource throughout the battle. David explained, “In addition to destroying many dumps of ammunition he rendered valuable assistance to the infantry who were held up by machine guns in an isolated building. “At first, failing to subdue the fire from this building, he three times rammed it with his Tank, which had the desired effect. During the attack, the crew covered eight miles in four hours. In his later report, Whittenbury said he ‘observed many casualties’ among the enemy. The 46th Australian Infantry Battalion he was protecting lost just 14 men.